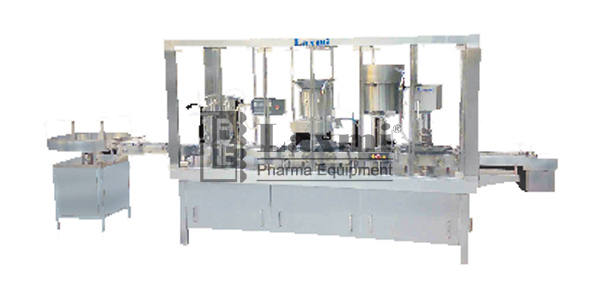 LAXMI Pharma Equipment introduces Automatic Two Head Volumetric Liquid Filling, Stoppering & Single Head Cap Sealing Machine Model: LBFS 40 (MONOBLOC), The machine consist of one Side turntables, S.S. slat conveyor belt, eccentric pre-gassing, filling & post –gassing S.S. -316 nozzles precision built S.S. – 316 Syringes, silicon rubber tubings, Bowl & Chute for Rubber Placement, Pressing device for stoppering, bowl & chute for Capping & sealing head, easy – reach compact panel etc. Due to its minimum distance between filling, stoppering and Sealing, the risk of contamination is reduced. It is designed for operating in a sterile area and for utilizing it under laminar flow protection. The un-scrambler itself has been designed in the machine to eliminate dead ends and difficult to clean spot. Filling, Stoppering & Capping Unit is completely in corporate in single body Structure. No Container, No Stopper, No Cap – Machine Stop System. Input (Container Dia/ Height) 160mm Dia to 50mm Dia/ Height 75mm Max.